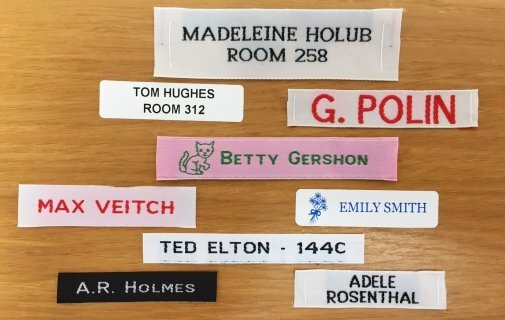 If you are looking for a name label that is particularly easy to attach to garments or other belongings so that they won’t get lost, you may be looking for stick-on labels. These labels offer all of the convenience of identification that iron-on and sew-on clothing labels do, but they are even easier to attach and remove than either of the other two options. Unlike the other two options, these labels aren’t limited to cloth garments, and they can be attached to MP3 players, toothbrushes, cups, lunchboxes, and any other number of hard objects. Easy Clothing Labels: If you want a simple way to label your child’s or elderly loved one’s clothing, stick-on labels are a viable option. Instead of having to remove other labels and attach new ones with the use of an iron or thread, these simply stick on to the existing label. School Supplies: If your child is in elementary school and regularly takes many shareable supplies with them to school, including markers, colored pencils, pencil boxes, and more, a simple stick-on label is a good way to make sure that the supplies are always returned. They can also be attached to lunchboxes so another child doesn’t accidentally pick up the wrong one and take it home. MP3 Players: Expensive electronics, like MP3 players, can be easily lost at school or work since they are relatively small. Placing one of these labels on the back ensures that they can be returned and that they won’t get mixed up with other players.